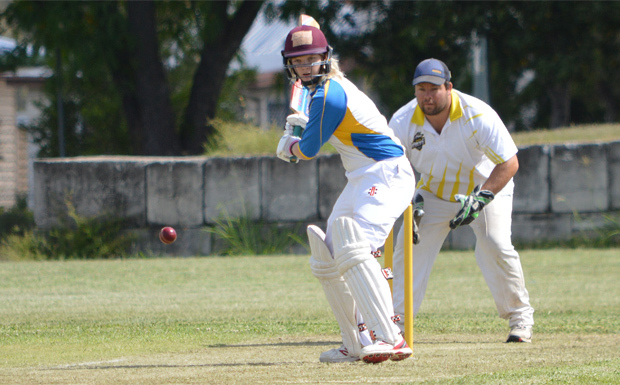 Murgon remains in top spot on both the A Grade Gympie and South Burnett B Grade competition ladders after notching up more wins last weekend. In Gympie, Murgon knocked off Gympie Harlequins; while in Murgon, the B Graders downed Wondai, securing Murgon’s fourth outright win in a row. In the A Grade competition, Murgon is six points clear of the opposition; in the B Grade comp, Murgon has a narrow one-point lead over Blackbutt and Kumbia. The Murgon Fruit Mart Diggers set Wondai an impossible target to chase in their game played at Murgon Sportsground on Saturday. Wondai won the toss and sent Murgon into bat. 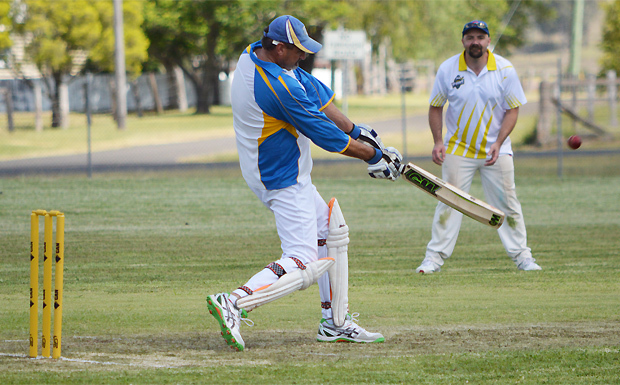 At the end of their 40 overs, Murgon were 5/304 after opener Jonathan Kapernick scored at the rate of a run a minute. Kapernick retired at 106 after hitting eight sixes and 11 fours. Andrew Roderick (37), Scott Kapernick (35), Nick Sanewski (32), Renee Irvine (27) and Riley Christoffel (27) added to Wondai’s woes. Ryan Henness was the best of the Wondai bowlers, taking 3/53 off eight overs, including one maiden. In reply, Wondai were all out for 134 in the 25th over. Chris Heness (69) and Ryder Brown (23) were Wondai’s top-scorers. 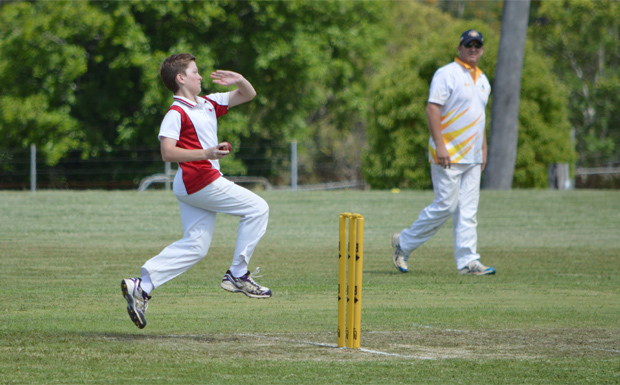 Murgon’s Lachlan Zelinski finished with the amazing figures of three wickets for three runs off just nine balls. Harry Sippel (3/14) and Riley Sippel (3/23) also took three wickets each. Nanango Scorpions defeated Kingaroy Services in their game played at Taabinga State School. Kingaroy won the toss and elected to bat but were all out for 163 in the 32nd over. Edwin Simpson (47) was best, followed by Fletcher Brown (39) and opener Glenn Kelly (25). Best of the Nanango bowlers were Sam Wilson (2/7 off two overs), Aidan Cavanough (3/13 off four) and Ben Greenslade (3/30 off eight). In reply, Nanango overtook the target in the 18th over, finishing with 5/185. Ben Greenslade (74) and Stephen Kirkland (71 not out) top-scored. Fletcher Brown (2/20 off five overs) was the best of the Kingaroy bowlers. Michael Marriott was well on his way to a double century when he ran out of partners in Timbertowners’ game against Kallindale Warriors played at Blackbutt. Blackbutt won the toss and batted first. Marriott, who came in at number four, finished 188 not out after hitting 28 fours and six sixes off just 97 balls. Mitchell Olzard (68) was also handy, with five sixes and four fours. Blackbutt finished with 318 off 32 overs. Brett Simpson (4/36 off six overs) was the best of the Warriors’ bowlers. In reply, Warriors were 7/234 at the end of their 40 overs. Paul Clegg (90) and Jeffrey Rose (65) were Warriors’ top-scorers. Mitchell Olzard (4/26 off six overs) was the best of the Blackbutt bowlers. Kumbia proved too strong for Cherbourg at home in their game played at Kumbia Sportsground. Cherbourg won the toss and sent the Rattlers in to bat. They were all out for 195 off 38 overs, with Karl Freeman (49) and Tony Dugdell (38) top-scoring. Dallas Bond (3/28 off six overs) and Terry Davidson (3/40 off eight) were the best of the Cherbourg bowlers. In reply, Cherbourg were all out for 124 in the 28th over. Brendan McCarthy (46 not out) and Tom Langton (46) were equal top-scorers for Cherbourg. Louis Fairbairn (4/18 off 7.5 overs) and Karl Freeman (3/9 off four) were the pick of the Kumbia bowlers. Kumbia won by 71 runs. Gympie Valleys were too good for Southern District Devils (Kingaroy) in their game played Spencer Oval in Gympie. Devils lost the toss and were sent in. The visitors were all out for 130 in the 39th over, with Lleyton Brown top-scoring with 54. Valleys made the target in the 31st over, finishing 4/133. Taylor Herrmann was the best of the Devils’ bowlers, taking 3/15 off five overs. Competition leaders Murgon Crusaders easily defeated Gympie Harlequins at Kozminsky Oval in Gympie. Harlequins won the toss and elected to bowl. At the end of their 40 overs, Crusaders were 325 for the loss of just two wickets. Jason Webber retired hurt on 108. Kurt McArthur (94) and Craig Murree (53) also put in strong performances. In reply, Harlequins were all out for 120 in 38.1 overs. Shane Polzin (3/7 off five overs), Graham Brown (3/15 off five), Ashley Sippel (2/19 off 5.1) and Nathan Roon (1/25 off six) did the damage. All games start at 12:30pm.